The HIV-1 accessory proteins Vpr, Vpu, and Vif are essential for viral replication, and their cytoplasmic production suggests that they should be processed for recognition by CTLs. However, the extent to which these proteins are targeted in natural infection, as well as precise CTL epitopes within them, remains to be defined. In this study, CTL responses against HIV-1 Vpr, Vpu, and Vif were analyzed in 60 HIV-1-infected individuals and 10 HIV-1-negative controls using overlapping peptides spanning the entire proteins. Peptide-specific IFN-γ production was measured by ELISPOT assay and flow-based intracellular cytokine quantification. HLA class I restriction and cytotoxic activity were confirmed after isolation of peptide-specific CD8+ T cell lines. CD8+ T cell responses against Vpr, Vpu, and Vif were found in 45%, 2%, and 33% of HIV-1-infected individuals, respectively. Multiple CTL epitopes were identified in functionally important regions of HIV-1 Vpr and Vif. Moreover, in infected individuals in whom the breadth of HIV-1-specific responses was assessed comprehensively, Vpr and p17 were the most preferentially targeted proteins per unit length by CD8+ T cells. These data indicate that despite the small size of these proteins Vif and Vpr are frequently targeted by CTL in natural HIV-1 infection and contribute importantly to the total HIV-1-specific CD8+ T cell responses. These findings will be important in evaluating the specificity and breadth of immune responses during acute and chronic infection, and in the design and testing of candidate HIV vaccines. The human immunodeficiency virus-1 (HIV-1) has infected over 57 million and killed over 22 million individuals worldwide since the beginning of the epidemic (1). Over 95% of HIV-1-infected individuals live in developing countries and have no access to antiretroviral treatment (1). The need for a vaccine that protects against HIV-1 infection or attenuates disease has never been more urgent. Understanding the correlates of protective immunity is a logical first step in vaccine development. In the case of HIV-1 immunity, accumulating data have shown a central role of HIV-1-specific CTL and T helper cells in controlling viral replication (2, 3, 4, 5, 6). To better understand immune control of viremia and for the design of potential HIV-1 vaccines, those regions of HIV-1 that induce strong virus-specific immune responses should be identified. To date, the analysis of HIV-1-specific immunity has largely focused on assessment of immune responses directed against the structural HIV-1 proteins Gag, Pol, and Env, as well as the accessory protein Nef (7). Recent data suggest that CTL responses directed against the early expressed regulatory proteins Tat and Rev also play a central role in the HIV-1-specific immune response (5, 8, 9). However, very little is known about the role of cellular immune responses directed against the other accessory proteins. The relatively small accessory HIV-1 proteins Vpu, Vif, and Vpr have important functions in viral disassembly, nuclear transport of the preintegration complex (PIC),4 viral assembly, and down-regulation of CD4 on the cell surface (10, 11, 12, 13, 14). Thus these accessory proteins appear to be essential for viral replication. However, the extent to which these proteins are targeted by CTL in natural infection remains to be defined, but their cytoplasmic production within infected cells suggests that they should be HLA class I presented and candidate targets for CTL-mediated lysis of infected cells. In this study, we performed a detailed characterization of CTL responses to Vpu, Vif, and Vpr, using recently developed techniques including IFN-γ ELISPOT and intracellular flow cytometric analyses, as well as T cell cloning. Our data provide evidence that the Vpr and Vif proteins represent important targets of cellular host defenses, whereas Vpu is infrequently recognized. In addition, the Vpr protein is one of the most frequently targeted HIV-1 proteins by CTL relative to the length of the protein. This report also provides a characterization of discrete CTL epitopes within these proteins, identified using overlapping peptides spanning the entire HIV-1 Vpr, Vpu, and Vif sequence. Sixty HIV-1-infected and 10 HIV-1-negative individuals were studied at the Massachusetts General Hospital. HIV-1-infected individuals included 45 subjects who were treated with highly active antiretroviral therapy within 180 days of HIV-1 infection, nine individuals with chronic treated HIV-1 infection, and six individuals with long-term nonprogressive HIV-1 infection, defined as viremia below 1000 HIV-1 RNA copies per milliliter for >6 years in the absence of any antiretroviral treatment. At the time of the CTL analysis, subjects on highly active antiretroviral therapy had been effectively treated for at least 6 mo and all had viral loads below 50 copies RNA/ml. The study was approved by the Massachusetts General Hospital Institutional Review Board, and all individuals gave informed consent for participation in the study. HLA class I molecular typing was performed at the Massachusetts General Hospital Tissue Typing Laboratory using sequence-specific primer-PCR (15). Peptides were synthesized on an automated peptide synthesizer (MBS 396; Advanced Chemtech, Louisville, KY) using F-moc chemistry. Seventeen overlapping peptides spanning the HIV-1 SF2 B clade Vpr sequence, 14 overlapping peptides spanning the HIV-1 SF2 B clade Vpu sequence, and 36 overlapping peptides spanning the HIV-1 SF2 B clade Vif sequence (12–18 mers with 10 aa overlap) were generated. In addition, peptides corresponding to described optimal HIV-1 CTL epitopes (7) and a panel of 321 overlapping peptides (15–20 mers) spanning the entire p15 Gag, p17 Gag, p24 Gag, gp41 Env, gp120 Env, reverse transcriptase (RT), Rev, Tat, and Nef sequence (16), were used. EBV-transformed B lymphoblastoid cell lines were established and maintained in R20 medium (RPMI 1640 medium (Sigma, St. Louis, MO) supplemented with 2 mM l-glutamine, 50 U/ml penicillin, 50 μg/ml streptomycin, 10 mM HEPES, and 20% heat-inactivated FCS (Sigma)) as previously described (17). For culture of CTL clones, medium containing 10% FCS (R10) supplemented with 50 U/ml rIL-2 (provided by Dr. M Gately, Hoffmann-LaRoche, Nutley, NJ) was used. CD8+ T cells were nonspecifically expanded from PBMC over 10 days, using a bispecific CD3/CD4 Ab. 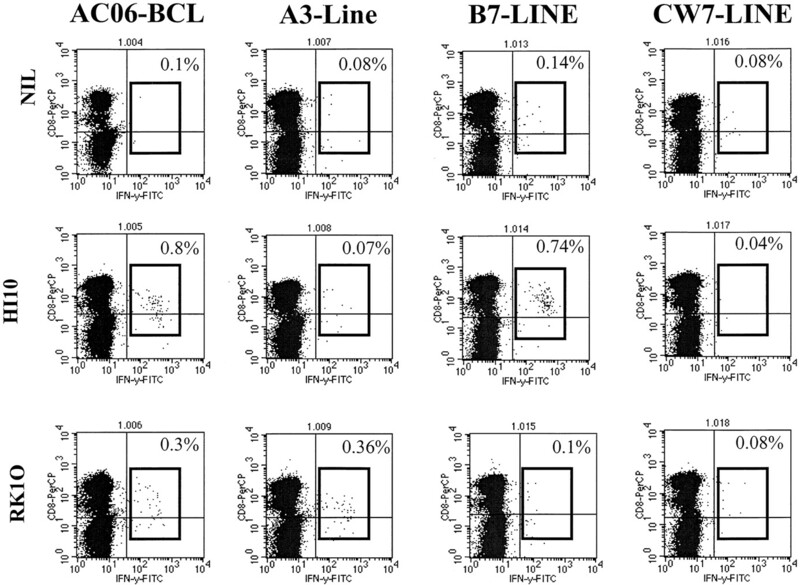 Peptide-specific CD8+ T cell lines were subsequently isolated using an IFN-γ catching assay (18, 19, 20), according to the manufacture’s instructions. Briefly, after expansion 10–20 × 106 CD8+ T cells were incubated on 24-well plates with 20 μM peptide and 1 μg/ml each of the mAbs anti-CD28 and anti-CD49d (BD Biosciences, Mountain View, CA) at 37°C, 5% CO2, for 6–8 h. Cells were subsequently labeled with a bispecific CD45/IFN-γ catching Ab and incubated for 45 min at 37°C, 5% CO2. After several washes, the IFN-γ-producing cells were stained with a second IFN-γ-PE detection Ab and separated by anti-PE mAb labeled with magnetic beads (MACS; Miltenyi Biotech, Hamburg, Germany). The isolated cells were then expanded for 10 days using autologous irradiated feeders, as described previously (21). CTL clones were isolated by limiting dilution as previously described (21, 22), using the anti-CD3-specific mAb 12F6 as stimulus for T cell proliferation. Developing clones were screened for HIV-1-specific CTL activity by 51chromium-release assay (17) against autologous B cell lines (BCLs) pulsed with the peptides recognized in the ELISPOT assays or infected with recombinant vaccinia virus (rVV) expressing either HIV-1 Vpr or Vif (provided by G. P. Mazzara, Therion Biologics, Cambridge, MA). HIV-1-specific clones were maintained by stimulation every 14–21 days with an anti-CD3 mAb and irradiated allogeneic PBMC. HLA-restriction of CTL epitopes was determined using a panel of target cells matched through only one of the HLA-A, HLA-B, or HLA-C class I alleles expressed by the effector cells (21). PBMC were plated on 96-well polyvinylidene difluoride-backed plates (MAIP S45; Millipore, Bedford, MA) that had been previously coated with 100 μl of an anti-IFN-γ mAb 1-D1k (0.5 μg/ml; Mabtech, Stockholm, Sweden) overnight at 4°C. Peptides were added directly to the wells at a final concentration of 1 × 10−5 molar. Cells were added to the wells at 50,000–100,000 cells/well. The plates were incubated at 37°C, 5% CO2 overnight (14–16 h) and then processed as described (23, 24). IFN-γ-producing cells were counted by direct visualization and are expressed as spot-forming cells (SFCs) per 106 cells. The number of specific IFN-γ-secreting T cells was calculated by subtracting the negative control value from the established SFC count. The negative controls were always <20 SFC per 106 input cells. Responses ≥40 SFC per 106 input cells above background were considered positive. The positive control consisted of incubation of 100,000 PBMC with PHA. CD8+ T cell dependence of all responses to synthetic peptides was confirmed by loss of IFN-γ production after CD8+ T cell depletion using magnetic beads (MACS; Miltenyi Biotech), according to the manufacturer’s protocol. Fine mapping of epitopes by ELISPOT assay was performed as described (23), using peptide truncations. Briefly, 100,000 PBMC/well were incubated with concentrations from 10−4 to 10−11 M peptide overnight on the ELISPOT plate. All assays were run in duplicate. The optimal peptide was defined as the peptide that induced 50% maximal specific IFN-γ production of T cells at the lowest peptide concentration (23). Intracellular cytokine staining assays were performed as described elsewhere with minor modifications (25, 26). Briefly, 0.5–1.0 million PBMC were incubated on 24-well plates with 2 μM peptide and 1 μg/ml each of the mAbs anti-CD28 and anti-CD49d (BD Biosciences) at 37°C, 5% CO2, for 1 h, before the addition of 10 μg/ml brefeldin A (Sigma). Following another 5-h incubation at 37°C, 5% CO2, the cells were placed at 4°C overnight. PBMC were then washed with PBS/1% BSA and stained with surface Abs, anti-CD8 and anti-CD4 (BD Biosciences) at 4°C for 20 min. Following three more washes, the PBMC were fixed and permeabilized using Caltag Fixation/Permeabilization Kit (Caltag Laboratories, Burlingame, CA) and anti-IFN-γ mAb (BD Biosciences) was added. Cells were then washed and analyzed on a FACSort Flowcytometer (BD Immunocytometry Systems, San Jose, CA) using PerCP, allophycocyanin, and FITC as fluorescent parameters. Control conditions were established by the use of autologous PBMC, which had not been stimulated with peptide, but otherwise had been treated identically. Cell population boundaries were established by exclusion of 99.97% of control lymphocytes. For the determination of HLA class I restriction of responses by flow cytometry, assays using HLA-matched or mismatched BCLs were run as described (27). Briefly, BCLs that were pulsed with 10 μM peptide for 1 h were washed five times before incubation with effectors (105 BCL and 5 × 105 effectors) in 1 ml of R10. The mAbs anti-CD28 and anti-CD49d were then added, and the assay was run exactly as described above. To determine whether the Vif, Vpr, and/or Vpu proteins are targeted by the CTL response in HIV-1 infection, we performed a pilot study in individual AC-06 in whom we had previously demonstrated responses to a total of nine CTL epitopes in p17, p24, RT, gp41, and Nef, and defined the optimal epitopes recognized within those gene products (16, 28). PBMC from subject AC-06 were analyzed by ELISPOT assay with a set of 388 overlapping peptides spanning the expressed HIV-1 clade B sequence. This allowed us to assess the relative contribution of Vpr-, Vpu-, and Vif-specific CD8+ T cell responses to the overall CD8-mediated immune response. Fig. 1⇓ shows the comprehensive characterization of HIV-1-specific CTL responses in this person using the entire panel of overlapping peptides including 17 peptides spanning Vpr, 14 peptides spanning Vpu, and 36 peptides spanning Vif, as well as peptides spanning p15, p17, p24, RT, gp41, gp120, Nef, Rev, and Tat. CD8+ T cell dependence of all responses was confirmed by CD8/CD4 depletion studies (data not shown). In addition to the nine previously demonstrated CTL responses, we detected at least two responses to Vif and one to Vpr (Fig. 1⇓). Of all of the responses detected, the response to an epitope contained in the Vif peptide THPRVSSEVHIPLG was the third highest in magnitude (1180 SFC/106 PBMC). These data indicate that multiple accessory proteins can be targeted simultaneously by the CTL response in a single individual, and failure to assess these responses would lead to an underestimation of total CTL responses. HIV-1-specific CD8+ T cell responses determined by screening PBMC in an ELISPOT assay using overlapping peptides (15–20 mer) spanning HIV-1 p15 (Gag), p17 (Gag), p24 (Gag), RT, gp41 (Env), gp120 (Env), Nef, Rev, Tat, Vpr, Vpu, and Vif. The amino acid sequences of recognized peptides are shown, and CD8+ T cell magnitudes are expressed as SFC/106 PBMC. A total of four different Vif peptides were recognized in this individual; however, these responses were induced by two epitopes contained within the overlap of each of two overlapping peptide pairs (see below). The above data indicate that Vif and Vpr were targeted by CD8 cells in this individual, but do not indicate the number of epitopes contained within each of the proteins. For example, the p17 Gag peptide WEKIRLRPGGKKKYK actually contains two discrete A3-restricted epitopes, KIRLRPGGK and RLRPGGKKK (7), and responses to two peptides in Vif that share a 10-aa overlap could represent targeting of an epitope shared by both peptides, or two discrete epitopes. To determine the contribution of epitopes within the accessory proteins to the overall breadth of the CTL response in this person, we next determined the optimal epitopes within these longer peptides, using newly adapted techniques (23, 27). This is exemplified for the two CTL epitopes within HIV-1 Vif (Figs. 2⇓ and 3⇓). The optimal sequences of these novel CTL epitopes were determined by ELISPOT assay, using PBMC and serial dilutions of truncated peptides (Fig. 2⇓, A and B). The peptide that induced 50% of maximal specific IFN-γ production at the lowest peptide concentration was defined as the optimal CTL epitope (Fig. 2⇓A: RIRTWKSLVK (RK10) for Vif-3; Fig. 2⇓B: HPRVSSEVHI (HI10) for Vif-10). The HLA restriction of these CTL epitopes was subsequently determined by flow cytometric quantification of peptide-specific IFN-γ production using PBMC and partially HLA class I-matched APCs (Fig. 3⇓). The Vif-RK10 peptide induced IFN-γ production of CD8+ T cells only when presented by autologous APC or APC expressing HLA-A3, demonstrating that this epitope was restricted by HLA-A3. This peptide also conforms precisely to the predicted motif for HLA-A3-presented peptides, with a nonpolar residue in position 2 and a lysine at the C-terminal of the peptide (29, 30). In contrast, the Vif-HI10 peptide was restricted by HLA-B7 (Fig. 3⇓), and conformed to the predicted motif for this allele (30). The sequence of the optimal CTL epitope as well as the HLA class I restriction was subsequently reconfirmed using a standard 51Cr release assayfollowing the isolation of peptide-specific CTL clones by limiting dilution (data not shown). In all, three novel CTL epitopes in two accessory HIV-1 proteins were identified by the use of overlapping peptides in this single patient (Table I⇓). Of the total of 12 epitopes targeted by individual AC-06, 3 (25%) were located in the accessory proteins Vif and Vpr. Definition of two novel optimal CTL epitopes within HIV-1 Vif. Titration curves using PBMC in an ELISPOT assay incubated with serial dilutions of truncated peptides within the Vif-3 peptide (A) and Vif-10 peptide (B). 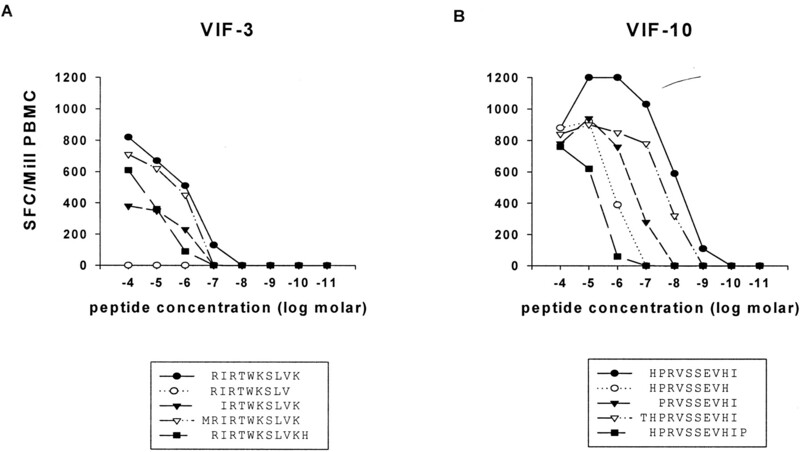 The truncated peptides used are shown, and the optimal CTL epitope was defined as the peptide inducing 50% of maximal specific IFN-γ production of T cells at the lowest peptide concentration (RIRTWKSLVK for Vif-3 and HPRVSSEVHI for Vif-10). Determination of the HLA class I restriction of the novel CTL epitopes within HIV-1-Vif (peptide RIRTWKSLVK, RK10; peptide HPRVSSEVHI, HI10), using peptide-pulsed APCs. The HLA class I type of the subject studied (AC-06) was A3/-, B7/-, Cw7/-. PBMC were incubated with either autologous APCs (AC-06-BCL) or APC lines only sharing one HLA class I allele with the subject studied (A3-, B7-, and Cw7-line). APC lines were incubated with the HI10 peptide, the RK10 peptide, or with no peptide as negative controls (Nil). The percentage of IFN-γ-producing CD8+ T cells are given in the individual plots. We next determined the contribution of responses directed against the individual CTL epitopes contained within the overlapping peptides to the total HIV-1-specific CTL responses in subject AC-06, using intracellular IFN-γ quantification by flow cytometry (Fig. 4⇓). Interassay variation, defined as the SD divided by the mean of the responses between assays run multiple times in parallel, was <12%, as determined in previous experiments to evaluate this technique (data not shown). Of the CD8+ T cells, 15.6% were specific for the tested HIV-1 CTL epitopes. The immunodominant response in this subject was directed against the HLA-B7-restricted CTL epitope GPGHKARVL (GL9) in p24 Gag. A total of 5.6% of CD8+ T cells were directed against this epitope, contributing 32% to the total HIV-1-specific CD8 responses. CD8+ T cell responses directed against the accessory proteins Vif and Vpr contributed importantly to the total responses (17% of total HIV-1-specific CD8 responses) in this subject. Therefore, these data indicate that the breadth and magnitude of the CTL responses in this person would have been underestimated by 25 and 17%, respectively, had responses directed against the accessory HIV-1 proteins Vif, Vpr, and Vpu not been assessed. Quantification of total HIV-1-specific CD8+ T cell activity at the single epitope level using intracellular IFN-γ staining. 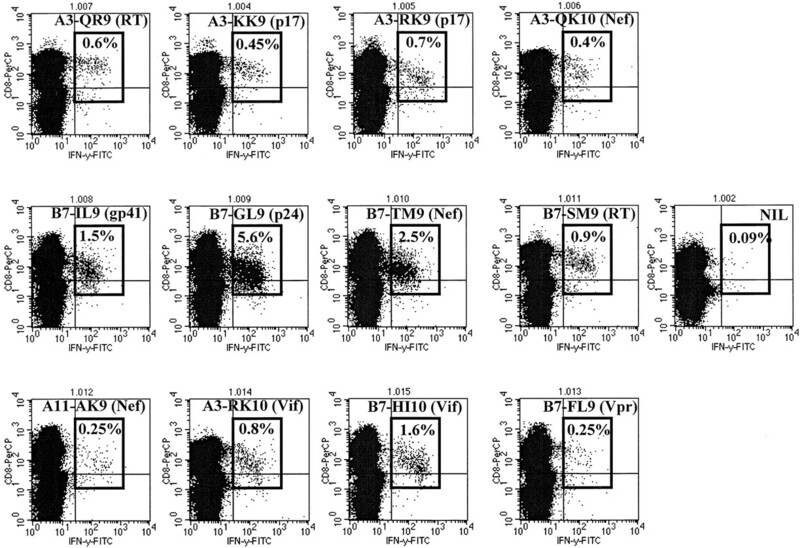 HLA class I restriction, first and last amino residue, number of amino acids, protein, and percentage of epitope-specific CD8+ T cells after subtraction of background activity are shown for each of the 12 CTL epitopes targeted by individual AC-06. Background activity in the negative control (NIL) was 0.09%. The data described above indicate that CD8+ T cell responses can target epitopes within the accessory HIV-1 proteins Vif, Vpr, and Vpu. To characterize CD8+ T cell responses directed against these accessory proteins in more detail, 60 HIV-1-infected individuals at different stages of infection (45 individuals with treated acute HIV-1 infection, 9 individuals with treated chronic infection, and 6 individuals with long-term nonprogressive infection) were screened for CD8+ T cell responses against these proteins by using overlapping peptides in an IFN-γ ELISPOT assay. PBMC from 27/60 (45%) HIV-1-positive study subjects recognized at least one overlapping Vpr peptide (Table II⇓), 20/60 (33%) individuals had responses against one or more Vif peptides (Table III⇓), and only one individual had responses against the Vpu peptides (individual CMW with long-term nonprogressive HIV-1 infection had confirmed responses against the Vpu-6 peptides at 170 SFC/106 PBMC). 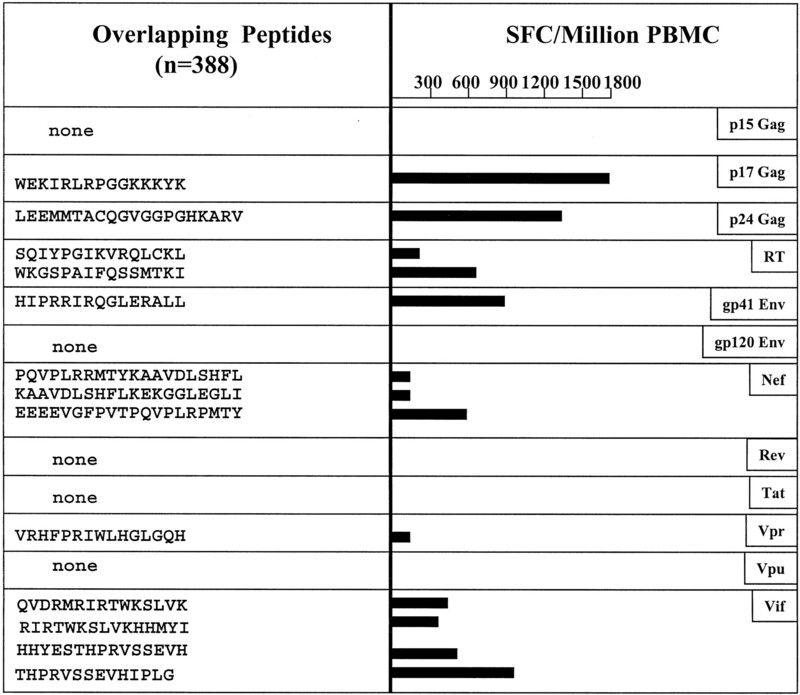 Magnitude of responses against the Vpr peptides ranged from 40 to 1400 SFC/106 PBMC (median 245), with Vpr-12 being the most frequently targeted. Responses against the Vif peptides range from 40 to 1100 SFC/106 PBMC (median 215), with Vif-6 being the most frequently targeted. CD4 depletion assays and flow-based analysis of peptide-specific intracellular IFN-γ production determined that all responses against the accessory proteins were CD8+ T cell mediated (data not shown). Individuals with long-term nonprogressive and treated chronic HIV-1 infection targeted the Vpr more frequently than individuals with treated acute infection (p = 0.03, two-tailed Fischer’s exact test), but not Vif (p = 0.8). This observation for HIV-1 Vpr is in line with our previous observation that individuals treated during acute HIV-1 infection have a narrowly directed CTL response, compared with individuals treated later in the course of infection (16). Responses against the tested Vif, Vpr, and Vpu peptides were <20 SFC/106 PBMC (range 0–20 SFC/106 PBMC, median 0 SFC/106 PBMC) in the 10 HIV-1-negative individuals used as controls. We next studied how frequently the accessory proteins Vif, Vpr, and Vpu were recognized compared with other HIV-1 proteins. Therefore, a subset of 29 HIV-1-infected individuals (4 with long-term nonprogressive infection, 17 with acute treated infection and 8 with chronic treated infection) were screened with a panel of 388 overlapping peptides spanning the entire Gag, gp41, RT, Rev, Tat, Vpr, Vpu, Vif, and Nef sequence, as described above for subject AC-06 (Fig. 1⇑), and frequencies of recognition were compared (Table IV⇓). Furthermore, the frequency of recognition was adjusted for the length of the proteins by dividing frequency by the number of amino acids per protein. Adjusted for its length, the HIV-1 Vpr and p17 Gag proteins were the most frequently targeted HIV-1 proteins in natural HIV-1 infection, whereas HIV-1 Vif was targeted as frequently as HIV-1 RT, gp41, or Tat. To exclude a potential bias toward an overrepresentation of responses directed against HIV-1 Vpr and p17 Gag due to the high frequency of individuals with HLA-A2 in the study cohort (40%) and the presence of epitopes restricted by this allele in both proteins (SLYNTVATL in p17 and AIIRLLQQL in Vpr; Refs. 31, 32, 33), we repeated the analysis after the exclusion of individuals expressing HLA-A2. HIV-1 Vpr and p17 Gag remained the most frequently targeted proteins within HIV-1, with length-adapted scores of 0.44 and 0.61. Comparing the frequency of recognition of different HIV-1 proteins among individuals with acute treated, chronic treated, and long-term nonprogressive HIV-1 infection, individuals with long-term nonprogressive infection and individuals with chronic treated infection had CD8+ T cell responses directed against more epitopes and more HIV-1 proteins than individuals with acute treated infection, as described previously for the structural HIV-1 proteins (16), but these differences did not reach statistical significance (Fisher’s exact test, p > 0.1). Taken together, these data extend the studies in individual AC-06 to show that the accessory proteins are frequently targeted by CD8+ T cells in HIV-1 infection. Despite over 140 optimal CTL epitopes defined to date, no Vif and Vpu epitopes have been mapped (34) and only two HLA-A2-restricted epitopes within Vpr, predicted by the HLA-A2 peptide-binding motif, have been described previously (31). In addition to the three novel HLA-A3- and B7-restricted CTL epitopes described above in subject AC-06, we characterized the optimal CTL epitopes restricted by different HLA class I molecules for peptides recognized frequently in the studied individuals and determined the percentage of individuals with the corresponding HLA type recognizing the epitope (Table V⇓). For all novel CTL epitopes, the optimal peptide sequence was defined using serial dilutions of truncated peptides as described above and the HLA class I restriction was determined by using peptides presented by autologous and partially HLA-matched cell lines. Optimal CTL epitopes were defined by ELISPOT and flow-based assays using PBMC in most cases and reconfirmed after isolation of peptide-specific cytotoxic CD8+ T cell lines in a standard 51Cr release assay (data not shown). For the HLA-B*1801- and HLA-B*5701-restricted CTL responses in Vif and the HLA-B*5701-restricted CTL response in Vpr, the frequency of peptide-specific CD8+ T cells in the peripheral blood was not sufficiently high to determine the optimal epitope sequence and the HLA restriction of the response directly using PBMC. For the characterization of these epitopes, CD8+ T cells were nonspecifically expanded using a CD4/CD3-bispecific Ab, and peptide-specific CD8+ T cell lines were subsequently isolated using a newly adapted IFN-γ catching assay that allows for the isolation of peptide-activated CD8+ T cells using magnetic beads. This is shown for the CD8+ T cells specific for the Vif-20 peptide in individual AC-04 (Fig. 5⇓). Using fresh PBMC, 0.3% of CD8+ T cells targeted this peptide (Fig. 5⇓A). After a 10-day expansion of CD8+ T cells using a bispecific CD3/CD4 Ab and IL-2, the peptide-specific CD8 population was expanded to 1.3% (Fig. 5⇓B). The frequency of these Vif-20-specific CD8+ T cells was further increased to 67% after isolation of peptide-specific cells using the IFN-γ catching assay (Fig. 5⇓C). CD8+ T cell lines isolated this way showed strong (>80%) peptide-specific cytotoxic activity at different E:T ratios in a standard 51Cr release assay (Fig. 5⇓D) and were used to determine the HLA class I restriction and minimal sequence of these novel epitopes by standard cytotoxicity assays (data not shown). These peptide-specific lines were also used in a cytotoxicity assay with autologous B lymphoblastoid cells infected with rVV expressing Vpr and Vif to demonstrate that the novel epitopes defined were effectively processed intracellularly, as shown for the HLA-B*1801-restricted CTL response in Vif (Fig. 5⇓D). Isolation of peptide-specific CD8+ T cell lines specific for peptide Vif-20. 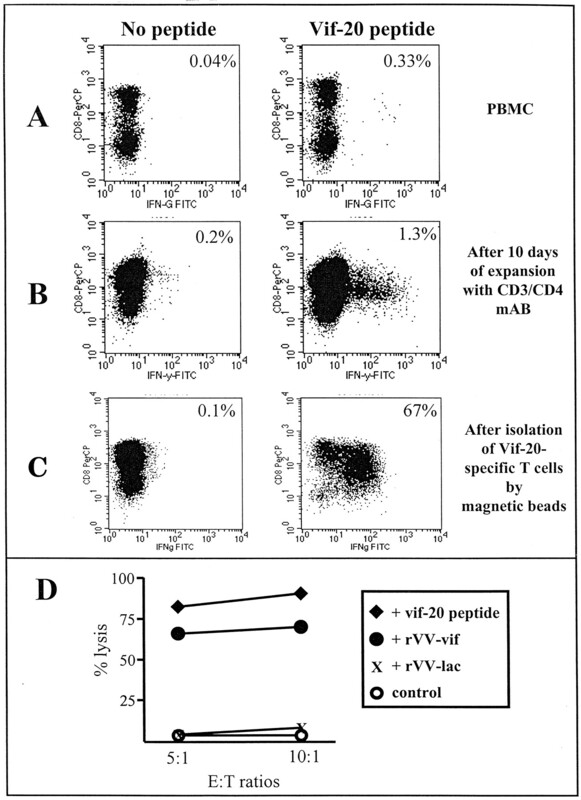 The percentage of CD8+ T cells specific for the Vif-20 peptide in individual AC-04 was quantified using PBMC (A), CD8+ T cell lines after 10 days nonspecific expansion with a CD3/CD4 bispecific mAb (B), and following the isolation and expansion of Ag-specific CD8+ T cells using the IFN-γ catching assay (C). The isolated Vif-20-specific CD8+ T cells showed high cytotoxic activity in a standard 51Cr release assay against autologous BCL pulsed with the Vif-20 peptide or infected with rVV expressing HIV-1 Vif (D). Background lysis of BCL pulsed with an non-HLA class I-matched peptide (control) or infected with rVV-lac was below 5%, respectively (D). Taken together, a total of nine novel CTL epitopes within the accessory HIV-1 proteins were identified and characterized. Several of these novel epitopes were restricted by HLA class I alleles common in the studied cohort, including HLA-A*0201, -A*0301, and -B*0702 (Table V⇑). The most frequently recognized CTL epitopes were the HLA-A*0201-restricted epitope AIIRILQQL (AL9) and the HLA-B*0702-restricted epitope FPRIWLHGL (FL9) in Vpr. AL9 was targeted by one-third (8/24) of the individuals expressing the HLA-A2 allele. FL9 was recognized by 4/8 individuals expressing the HLA-B7, as well as by the two individuals in this cohort that expressed HLA-B*8101, an HLA class I allele common in the African population, indicating a high degree of cross-presentation and -recognition between these closely related HLA class I alleles. Also, two novel epitopes restricted by HLA-B*5701, an allele associated with long-term nonprogressive HIV-1 infection, were identified and frequently recognized in individuals expressing the corresponding allele (Table V⇑). These studies not only characterize multiple epitopes within these accessory proteins, but show that the CD8+ T cell responses detected are associated not only with IFN-γ production but also with cytolysis. HIV-1-specific CTL responses have been studied in great detail since their first description (17, 35). Increasing evidence suggests that a comprehensive assessment of CD8+ T cell responses against HIV-1 is necessary to interpret the entire magnitude and breadth of these responses (8, 16). We have recently demonstrated that the use of overlapping peptide spanning the HIV-1 structural as well as regulatory proteins allows for a detailed characterization of HIV-1-specific CTL responses and the identification of novel CTL epitopes within these proteins (9, 16, 23, 24, 27, 36). However, the relative contribution of CTL responses directed against the accessory HIV-1 proteins Vpr, Vpu, and Vif have not been studied to date. In these studies CD8+ T cell responses directed against these accessory proteins were characterized in 60 HIV-1-infected individuals comprehensively by using overlapping peptides spanning the entire Vpr, Vpu, and Vif sequence of HIV-1. We demonstrate that the accessory HIV-1 proteins Vpr and Vif are frequently targeted by HIV-1-specific CD8+ T cells, with 45 and 33% of the tested individuals having detectable responses to these proteins, respectively, contributing importantly to the total HIV-1-specific CTL responses. In contrast, HIV-1 Vpu is rarely targeted by CTL in infected individuals. These studies also indicate that there are multiple epitopes contained within Vif and Vpr, and include fine mapping of nine optimal CTL epitopes within these proteins. In these studies we used a comprehensive set spanning expressed HIV-1 proteins to characterize the relative role of each protein as a target for CD8+ T cell responses. Interestingly, HIV-1 Vpr was the most frequently targeted HIV-1 protein, together with p17 Gag, when adapted to the amino acid length of the protein. It can be speculated that several factors may contribute to the high recognition of Vpr and p17 by virus-specific CTL. First, the high frequency of HLA-A2 in our Caucasian study population may have contributed to an overrepresentation of Vpr- and p17 (Gag)-specific responses due to immunodominant HLA-A2-restricted CTL epitopes within p17 and Vpr. However, a re-evaluation of our data after the exclusion of individuals expressing HLA-A2 from the analysis showed that the frequent recognition of HIV-1 Vpr was independent from the overrepresentation of this allele in the study cohort. Another factor influencing the recognition of viral proteins by CTL may be the amount of expression of these proteins during viral infection, with proteins expressed at high frequencies being more frequently targeted by CTL. Indeed, HIV-1 Gag and HIV-1 Vpr are expressed at higher levels in infected cells compared with HIV-1 Pol and also at higher levels compared with HIV-1 Vif (37, 38). However, a potential relationship between frequency of recognition by CTL and expression levels of the corresponding protein remain to be determined. Finally, the degree of sequence conservation within a particular HIV-1 protein may influence its recognition by CTL, as these proteins are less likely to escape from CTL-mediated immune pressure, leading to the potential accumulation of responses directed against these more conserved proteins. HIV-1 p17 and Vpr are reported to be relatively highly conserved, but are not more conserved than RT, which was much less frequently targeted (39). Additional studies, including analysis of the autologous viral sequence, are needed to better understand the relation between frequencies of CTL recognition and virus variability. Taken together, these data suggest that responses directed against the accessory HIV-1 proteins are frequently detected in natural HIV-1 infection and may contribute importantly to the total virus-specific CD8+ T cell responses. Several novel techniques adapted during the last year have allowed a more rapid characterization of novel CTL epitopes, using PBMC with no prior in vitro expansion. These newly adapted techniques include the fine-mapping of novel CTL epitopes using serial dilutions of truncated peptides in an ELISPOT assay (23) and the determination of HLA restriction of these novel epitopes using APCs only sharing one HLA class I allele with the corresponding donor in a flow-based restriction assay (27). However, these techniques require a frequency of CD8+ T cells specific for the studied epitope of at least 0.3%, in particular for the flow-based HLA restriction assay, to provide significant and reliable results. In this study, we describe an additional technique that allows for the rapid generation of peptide-specific CD8+ T cell lines, including lines specific for epitopes recognized by CD8+ T cells at low frequencies. The nonspecific stimulation of CD8+ T cells with a bispecific CD3/CD4 Ab allows for the expansion of CD8+ T cells to levels that enable the sorting of peptide-specific CD8+ T cells in an IFN-γ catching assay using magnetic beads. These peptide-specific CD8+ T cells can be further expanded after restimulation with autologous feeder cells and exhibit strong peptide-specific cytotoxic activity in a standard 51chromium release assay. This newly adapted assay will further facilitate the identification of novel CTL epitopes and allow for the rapid generation of epitope-specific T cell lines that can subsequently be used for functional assays. The accessory HIV-1 proteins Vpr, Vpu, and Vif are essential for viral replication and have important roles in the early phases of the viral life cycle (10, 11, 12, 13, 14). HIV-1 Vpr is implicated in the nuclear translocation of the PIC after infection (40, 41, 42, 43) and the arrest of the cell cycle in the G2 phase (44, 45). HIV-1 Vif may play an important role in viral disassembly after infection, the transport of incoming viral PIC to the nucleus, and HIV-1 provirus formation (46, 47, 48, 49, 50). Different structural regions within these proteins have been linked with their function. The Vpr protein contains four structural regions: the N-terminal region, the arginine-rich C-terminal region, and one central domain containing two putative α helices (Hα1 and Hα2) (41, 51, 52, 53). It has been shown that the C-terminal basic region appears to be critical for the cell cycle arrest (52, 53, 54) and that the two α helices are involved in the nuclear localization of the protein as well as the incorporation of Vpr into virus particle (41, 51, 52, 53, 54, 55). The association between function and structure is less well established for HIV-1 Vif (56, 57, 58, 59, 60). Several of the newly defined CTL epitopes map to important functional domains within the Vpr protein. The most frequently recognized novel CTL epitope AIIRILQQL, restricted by HLA-A*0201, is located within the α helix (Hα2) of Vpr. This region within Vpr is highly conserved (61), and single point mutations, involving either the isoleucine residue in position 60 that represents the P2 anchor residue for the HLA-*0201-restricted epitope or the C-terminal anchor residue (position 67) of the novel epitope, have been recently shown to result in a loss of the perinuclear localization of the wild-type protein (51), indicating the important function of this region. It has been suggested that CTL responses directed against functionally important regions within the virus could be more effective, as CTL-induced viral escape mutations within these domains are less likely to occur or may lead to reduced viral competence (62). In particular, mutations within Vpr and Vif have been observed in individuals with long-term nonprogressive HIV-1 infection and were associated with replication-deficient viruses in human and macaque infection (63, 64, 65). Longitudinal analysis will be required to evaluate whether the virus is less likely to escape from CTL targeting epitopes located within these accessory proteins and whether these responses have any impact on disease progression. In conclusion, this study demonstrates that the accessory HIV-1 proteins Vpr and Vif are frequently targeted by virus-specific CD8+ T cells, whereas Vpu is not. Adapted to the length of the proteins, Vpr was preferentially targeted by HIV-1-specific CD8+ T cells compared with other viral proteins. Despite the small size of these proteins, multiple novel CTL epitopes within Vpr and Vif were defined, several of them located within functionally important sites of these proteins. These novel CTL epitopes will allow for a more detailed study of CTL responses directed against HIV-1 and may represent potential candidates for future HIV-1 vaccines. ↵1 The Doris Duke Charitable Foundation, the National Institutes of Health (R37 AI128568, R01 AI30914, R01 AI44656, R01 AI40873, U01 AI41535, and U01 AI41531), the Deutscher Akademischer Austauschdienst, the Deutsche Forschungsgemeinschaft, the Lloyd Foundation, the Partners/Fenway/Shattuck Center for AIDS Research, and several private donors supported this research. B.D.W. is the recipient of a Doris Duke Distinguished Clinical Scientist Award and P.J.R.G. is an Elisabeth Glaser Scientist of the Pediatric AIDS Foundation. ↵3 For the HIV Study Collaboration: Nesli Basgoz,* Gregory K. Robbins,* Ben Davis,* Paul E. Sax,¶ Steve Boswell,∥ and Dan S. Cohen∥. ↵4 Abbreviations used in this paper: PIC, preintegration complex; RT, reverse transcriptase; rVV, recombinant vaccinia virus; SFC, spot-forming cell; BCL, B cell line. Brander, C., P. Goulder. 2000. The evolving field of HIV CRL epitope mapping: new approaches for the identification of novel epitopes. B. T. M. Korber, and C. Brander, and B. D. Walker, and R. A. Koup, and J. Moore, and B. Haynes, and G. Meyer, eds. HIV Molecular Database Los Alamos National Laboratory, Los Alamos, NM. Brander, C., P. J. R. Goulder. 1999. Recent advances in HIV-1 CTL epitope characterization. B. T. M. Korber, and C. Brander, and B. D. Walker, and R. A. Koup, and J. Moore, and B. Haynes, and G. Meyer, eds. HIV Molecular Database Los Alamos National Laboratory, Los Alamos, NM. Korber, B., B. D. Walker, C. Brander, R. A. Koup, J. Moore, B. Haynes, G. Meyer. 1999. HIV Molecular Immunology Database 1999 Los Alamos National Laboratory: Theoretical Biology and Biophysics, Los Alamos, NM.